Dr. Brusky took over The Center for Dental Excellence in 2007. Wanting to make a big splash, he hired an SEO professional. That professional was a recommendation from a colleague and seemed trustworthy. Dr. Brusky saw results, only to find out that those techniques came from Black Hat techniques. Two years ago, with a sandboxed website, Dr. Brusky turned to Millionairium. Dr. Brusky’s website saw a boost of 319% more organic traffic in a single year. Last month, 35% of new patients came from the Internet, a product of Millionairium dental SEO. Orange County, CA – Green Bay Dentist Dr. David Brusky is no stranger to dentistry. It runs in his family. His father opened The Center for Dental Excellence in 1969. In ’93, David joined his father, and the office expanded to a new location soon after. When Dr. Brusky Sr. retired, David took over and began the process of making The Center for Dental Excellence his own. 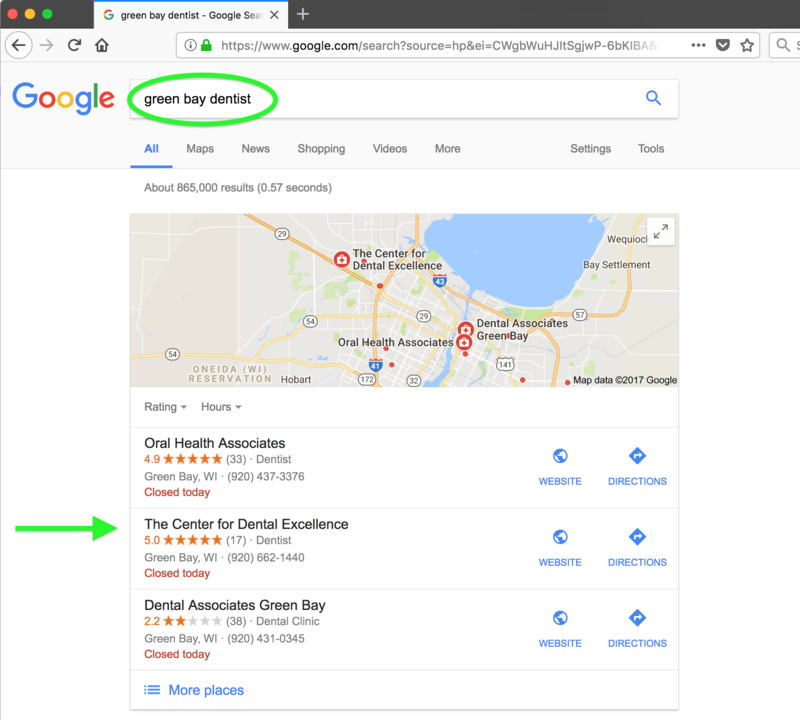 The Green Bay dental market is nearly saturated, and David knew that he needed to make a big splash initially if he wanted to get his name out there in a positive way. He soon received a recommendation from a colleague that there was an SEO professional in California who specialized in dental marketing. “This guy is great,” his colleague told him, and David took him at his word. He hired the SEO, and David began his foray into digital dental marketing. Hindsight is always 20/20 and, looking back, as dental search engine optimization professionals, we can see that David’s Internet marketing efforts were doomed from the start. But it was not his fault. He simply didn’t know then what he knows now. To begin, David was using a personalized template for a website. That same website design, and most likely much of the wording, was also being used on dozens of other doctors’ sites. Back then, however, duplicate content wasn’t as much of a penalizing offense in Google’s eyes as it is now. How did the SEO guy do? At first, he did great. He used Dr. David’s current website as his homebase of operations and went to work. Almost instantly, David’s Green Bay dental practice website began to rise in the rankings. Backlinks and Fake Reviews, Oh No! With his website visible in Google, David felt pleased with his decision to hire an SEO pro. In this industry, it’s difficult to know who to trust. And this guy was delivering, or so he thought. Things were fine, for a while, until Google decided that too many webmasters were gaming the system. See, this SEO guy in California that Dr. Brusky hired did what countless SEOs did during that time, which was purchase thousands of backlinks for pennies on the link. A backlink is a link on a website that points back to your site. Google had the idea that websites would only link back to websites that proved valuable. Therefore, websites with lots of backlinks were seen as high-value, and their rankings rose. The problem is that people started buying backlinks and using free tools that blasted out links like confetti and made just as much of a mess. While all those links resulted in a major boost in David’s search rankings, the celebration was short lived. Google ended the party when it deemed backlinks, among other techniques, as Black Hat, which essentially means they’re no-nos. After several major algorithm changes, David’s website tanked and there was little recourse. Then, David started working with us, the legitimate dental SEO professionals. When I first met David, his website was sandboxed, which means that it was so far penalized by Google that it was hidden from the results. To get it back, we would have to undo all of the damage his previous SEO had done. This posed a problem as his website URL was appearing on thousands of websites around the world and Google was taking notice. All of those backlinks would have to be undone. Then, David noticed that this SEO was posting fake reviews and other materials that weren’t authorized. David asked him to stop, but the materials kept showing up online. The damage was done, and it was continuing beyond David’s control. To repair the damage, we suggested that David start anew. We created a new website for The Center for Dental Excellence that was designed with industry best practices and infused with SEO from the start. And David’s rankings began to rise right away using our time-tested search engine optimization methods. But they weren’t rising as fast as we suspected. Turns out, we still had duplicate data to contend with, which resulted in a complete rewrite of David’s website and a complete overview of his SEO processes. Finally, we found that sweet spot, and David hit page one and number one in Google for several important keywords. It was a slow process, as the Green Bay area is full of dentists clamoring for the top spot. Yet, after two years of diligent work, and just as we neared the end of our contract, David’s website hit top billing for several important keyword terms. Dr. Brusky now enjoys top spot billing for many of his significant keywords and the rest are well on their way to Google number-one. There has been a 319% improvement in organic search rankings, a 351% increase in new users, and out of the 20 people who visited the dentist as a first-time patient last month, 7 of them came from the Internet, a product of Millionairium SEO. “Word of mouth continues to be the biggest generator of leads to our office. But SEO is by far a close second, and it’s necessary for our success. I feel good about my decision to work with Ali and Millionairium and to stay with them when I thought about leaving. He and his team have done a terrific job, and I’ve enjoyed working with them,” said Dr. David Brusky, Green Bay Dentist and one of our most loyal and valued clients. To get results like Dr. David Brusky, known as Green Bay’s Gentle Dentist, call Millionairium at 310-299-2799 or email us today. Ask about Pay-Per-Lead, our new affordable SEO payment plan where you only pay when you get leads! And remember, we don’t just work with dentists, cosmetic dentists, and orthodontists. We also work with lawyers, plastic surgeons, and other small and local business owners. Call us today for a free SEO consultation. For a newbie blogger like me, it is very difficult to learn the SEO practices. An experienced blogger like you keeps us motivated by sharing these types of article. Now I am going to follow the same thing.